Athletic history will be made on Sept. 14 when VCS hosts our first-ever home opener on our newly renovated sports field. The Crusaders will take on the Knights from The Bishop’s School of La Jolla for both JV and varsity football games at noon and 3 pm respectively. This will be a historic game for VCS as we were never able to host a home game on the old field. Seating and parking will be in high demand, so come early and celebrate our school and our team. The Field of Dreams is a state-of-the-art turf field installed by Hellas Construction using their top-grade Matrix Triad Turf. 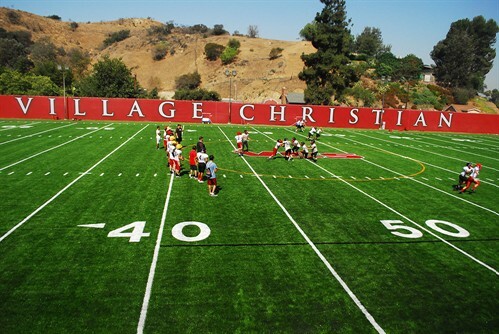 VCS is the only school in California using this new turf, and will be a showcase school for Hellas Construction. “The Field of Dreams will provide every student at VCS with a safe, state-of-the-art playing surface that saves water for our community. We are grateful to all of the donors and contractors who made this great new facility possible,” said Tom Konjoyan, head of school. The newly renovated lower field opened on Aug. 13, just in time for football practice. The field will also be used for middle school football games, soccer matches, and lacrosse matches. It will be used daily for elementary recess and PE. A dedication ceremony honoring the donors and all who contributed to the completion of the field will be held on Saturday, Aug. 24 at noon. A plaque bearing the names of donors will be unveiled. The ceremony will take place between the JV and varsity scrimmage games that are being played on the field that day. As we look toward raising the final portions of the project costs, we invite you to be a part of the Field of Dreams. If you would like to partner with us in this project, you may do so here, or by contacting Mr. Tracy Nightingale, vice president, at tracyn@villagechristian.org.